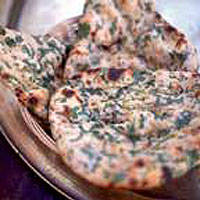 These are traditionally cooked in a tandoor, which produces beautifully puffy results. Baked in a conventional oven, they will be slightly flatter, but just as delicious. Whisk the milk, egg, sugar and yogurt together. Mix the flour, salt and bicarbonate of soda. Pour the milk mixture into the flour mixture and combine to form a soft dough (add a little water if the dough seems stiff). Knead for 3 minutes. Drizzle on the oil and knead for another 2 minutes. Cover with a clingfilm and leave to rest in the fridge for 30 minutes. Meanwhile, beat the chopped garlic and coriander into the softened butter. Preheat the oven to 220°C / gas mark 7. Divide the dough into 8 balls, weighing approximately 60g each. Smear a blob of butter on each ball of dough then flatten the balls with your hand and shape into teardrop shapes, about 5mm thick. Place on a non-stick baking tray and bake for 5-7 minutes. Serve warm.